A tale of two majors: English and psychology. The number of English majors has been precipitously declining; the number of psychology majors has been rising. It's true on my campus and it seems to be true a lot of places. 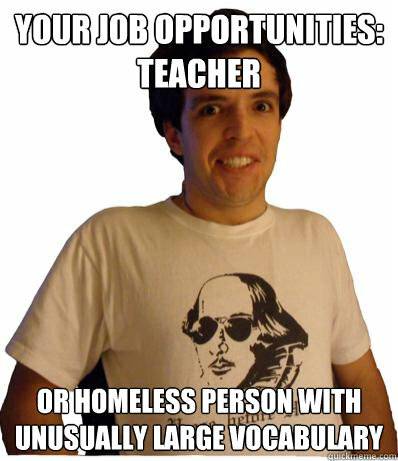 The knee-jerk explanation for the decline of English majors is their putative unemployability, as the memes at the left would suggest. That canard is a subject for another post. But it would then follow that the growing numbers of psychology majors reflect an abundance of lucrative jobs for new graduates. Except that's not what the numbers say. According to the spring 2015 Salary Survey conducted by the National Association of Colleges and Employers, there's no starting-salary advantage to majoring in psychology. None. 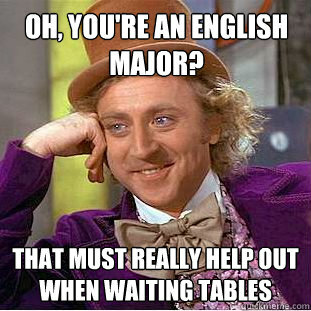 In fact, English majors do ever so slightly better. The mean starting salary for English majors, based on the reported actual earnings of class of 2014 graduates, was $33.236. The mean starting salary for psychology majors: $33,192. Granted, among the 45,000 students surveyed, only 763 of them were psychology majors, and only 317 were English majors. Still, more than twice as many students saw fit to earn low-ball starting salaries with an psychology degree than an English degree, though it's hard to see why from the numbers alone. The fact that the numbers are equally damning for both majors compels me to point out that liberal arts students of all varieties are less well-served by "first-destination" surveys than are students coming out of preprofessional college programs. Students emerging with valuable transferable skills often need time post-graduation to figure out where and how they want to transfer those skills. Their departments don't, as a matter of course, have the resources for corporate engagement and active placement programs. Still, for students weighing a choice between a preprofessional major and a liberal arts major, the choice of psychology over English is not self-evidently prudent. So why are so many students making it? I have some thoughts, but they await a future post. But why, really? This starting salary availed itself to 64% of psychology graduates, as compared to 38% of English ones, as the same survey shows. Venturing into the dangerous zone of reading someone's intentions, I'd guess you read these numbers, but decided to keep them to yourself to create a cliffhanger - reasonable move! which implies though, that your average "interpretive social sciences" reader won't bother to check the data for themselves.